chirping birthday notes— and readied it to be bundled and sold. The move toward sharing more personal information only is clearly enticing for companies from Twitter to Google and Facebook. They are betting that consumers will see the value in sharing their information — not just with their friends, but with everyone online. making his info public just like everyone else’s. Meanwhile, Google CEO Eric Schmidt implied last week that only people with something to hide would be concerned about having their personal information on Google. There’s plenty of data to indicate that consumers will follow along with the trend of sharing formerly private information. As I wrote last week, 85% of Facebook users have never changed their profile settings. Meaning that their Facebook information will now be public. more than 50% of its users have rejected the defaults since the company sent info public. That is a pretty big shift. Meanwhile, even Zuckerberg is confused by the changes. Valleywag has posted a guide to navigating the changes, and notes that Zuckerberg has changed his setting at least three times since the default switch. Facebook has compiled an impressive library of information on its users. But repeatedly the company has run into trouble when it has tried to make money from that data. The company is hoping to get in on the real-time social shift led by Twitter, but the sheer quantity of information that people share on the service makes that a difficult endeavor. If it becomes too complicated to manage that information, people are likely to shrink back from sharing so much of their info online. Facebook is clearly hoping that bringing all of this information public will make it more relevant in Google searches — and enticing to marketers and advertisers. But that is predicated on people volunteering their information to the site. If they’d rather not put their data somewhere they feel is unprotected, Facebook could lose its store of personal information. It’s too early to tell if people will balk en mass, but it could end up being a real issue for Facebook. The network has created privacy settings for users who would rather not share their info with the whole world, but there may also be a subset of users who stop using the site altogether for fear of what may happen to their profiles in the future. Facebook has overestimated consumer interest in sharing their information before. And while it’s not a far stretch to assume that the trend toward sharing more information online will continue, Facebook has to be careful where it steps, as the lesson of Beacon (its failed attempts at targeted social advertising) can attest. Facebook today went live with new privacy settings the company announced this summer. The new settings purport to give users more control of the ways their information is shared, but the default settings (which most users never touch) are set to send user data to the greater web. Why is that? Because for Facebook to capitalize on its store of in depth user information, it needs to make that information public. 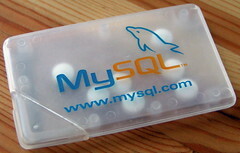 Will MySQL falter under Oracle’s ownership? owned by Sun and offered freely under a GNU General Public License.